The Mount Zion Prayer Hill has been established as a neutral platform for the accommodation of individual prayer warriors, intercessors, prayer groups and ministries across denominational and church boundaries. Its main business, however, is the establishing of Houses of Prayer all over Ekurhuleni, South Africa and the continent of Africa. 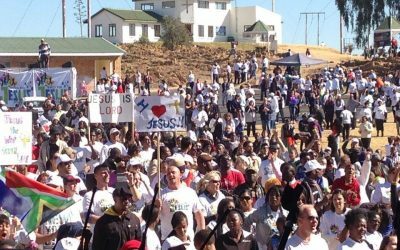 Extended facilities have been developed on and around the prayer-hill, like the main prayer centre, prayer cubicles, a coffee shop (“The Outer Court”), a baptism pool, ablution facilities, an open stage, ample parking, overnight sleeping facilities, etc. Stay up to date with the latest news and events from Mount Zion Prayer Hill. We respect your privacy and will never share your contact details with any third parties.